The All Progressive Congress (APC) governorship primary in Lagos state has been cancelled. National Working Committee (NWC) panel for the poll led by former Cross River governor, Clement Ebiri, announced the cancellation Tuesday. Although, primary elections were held in the 20 Local Government Areas LGAs and 37 Local Council Development Areas LCDAs of the state Tuesday, Mr.Ebiri panel said it was never authorized by its panel, insisting that materials for the primary is still with them intact. Mr. Ebri argued that the primary could not have held as his committee was still expecting the list of representatives of one of the two aspirants. “Yesterday (Monday) we were told to adjust our modalities to suit the open ballot that the state is clamouring for and we told them that for us to do that, both parties will present a list of representatives from all wards that would represent them in the election and it wasn’t provided,” Mr Ebri said while responding to a question on whether Tuesday’s primaries had been cancelled. He said : “The preparatory process had just been concluded for the primaries. The primary is to begin anytime soon. There was no election. Election materials are being sorted. The stage is set and election begins anytime from now. We have guidelines and we will stick to the guidelines. “Because of the political tension in the state, we decided to be very careful, very methodical. As party men, peace is more important to us than victory. We want a kind of victory that will be celebrated by both parties. Mr. Ebiri said his panel is still awaiting the list, adding that anything done outside that is unacceptable. “Anything that was done without the list we waited for, I can’t wait for a list for over nine hours and I didn’t see anything and you expect me to go ahead? We had a meeting with the representatives of the aspirants as early as 8am and we told them to bring lists of representatives from each LG to monitor the election on their behalf. I got names for 20 LG reps from one side and only got seven from the other side and we just got for additional eleven LG from them. 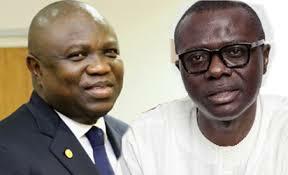 The Lagos APC governor primary is being contested by Babajide Sanwo-Olu and the incumbent Governor Akinwunmi Ambode. Mr. Sanwo-Olu at the moment enjoys huge support from APC members and former Lagos governor, Bola Tinubu. “Because there are two major contenders in the primary election, they needed to take their time to prepare well in other to ensure that they were fair to both parties,” Mr. Ebiri said. The APC Chieftain did not announce the new date the primary will now hold. Tuesday incident will make it the fourth time Lagos APC Gubernatorial primary will be shifted.